Book Review: “A Visual Defense” by Robert Velarde | J.W. Wartick -"Always Have a Reason"
Robert Velarde’s A Visual Defense: The Case for and Against Christianity is a unique work among the growing number of introductory apologetics books on the market. In some ways, this is a good thing; in others, it is a disadvantage. The clear and extremely important benefit of the work is that it really does provide a way for people to envision how a number of arguments related to the truth of Christianity would look mapped out. The way that Velarde brings this out is by making a flow chart with the argument mapped out alongside objections and rebuttals. The flow charts themselves are extremely helpful, because they really do allow one to sit with the book and use a finger to trace how the argument would work in practice. Although I was familiar with the arguments given, I felt as though I learned some things simply by seeing the arguments lined up in such a way as to follow them pictorially. The format of the book is also very helpful. Each chapter begins with a flow chart that addresses a specific topic via an argument(s). The different parts of the flow chart have different shapes depending on whether they are the conclusion, assumption, premise, or rebuttal. These flow charts have every bubble numbered. The chapter following the flow chart simply lays out the numbers in order and explains in greater detail the conclusion, the premises, the objections, and the rebuttals. Thus, the format is highly readable and helps to draw out the flow chart more readily. I found myself flipping back to the flow chart very frequently as I read through the book. This book cannot really be used in isolation. One either needs another stack of books to get to the heart of many of the topics introduced or to come to the book with a working knowledge of a wide range of apologetics topics. The numbered outline of each part of the flow chart often gives only a small paragraph in defense of rather major apologetics topics. For example, the defense of the argument from religious experience comprises a page and a half and three bubbles on the flow chart (46-47). The argument itself is an area of major interest for me and, having read ten books and multiple articles on the topic, I realize it is a really massive issue. 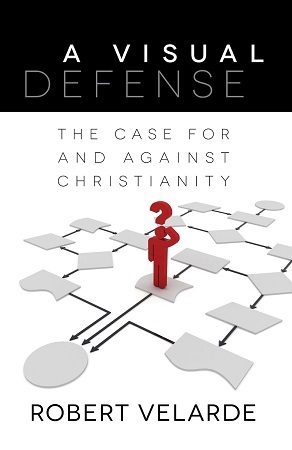 But due to the format of the book, this diminishes its value somewhat, as it seems like it would best be used as part of an apologetics class or an introduction to the issues related to the defense of the Christian faith. However, in order to do so, one would need a hefty general apologetics book(or a couple more specialized ones) to use alongside it. I’m sure this was a conscious decision on the part of Velarde and others–the book is surely intended to be used in this fashion–but that doesn’t make the price of entry for newcomer any less. The “visual” aspect of the visual defense could also be better integrated in the body of the work. The flow charts are extremely helpful, but it perhaps could have been even better to have a few more of them scattered about to use as defenses of various premises or other issues. I’m not a visual learner, so I admit it is hard for me to brainstorm on this, but I also think that the book could have perhaps integrated more pictures to show how the argument moves from one point to the next. Robert Velarde is to be commended for taking a unique approach to introducing apologetics. The importance of providing a way for visual learners to understand these arguments in a pictorial fashion should not be understated. That said, the book essentially requires others to be read alongside it. I would imagine this book would be most useful for professors or small groups wanting to introduce the topics as opposed to a book to pick up and hand to a friend interested in apologetics. It would be a great tool to utilize in an apologetics class to introduce each major argument and then proceed into lengthier defenses of each. Robert Velarde, A Visual Defense: The Case for and Against Christianity (Grand Rapids, MI: Kregel, 2013). I was provided with a review copy of the book from Kregel. I was in no way asked or required to offer any specific type of review. My thanks to the publisher for the review copy. I have found over the years that people in general who do not accept or understand the most basic fundamental truths of our faith, such as the resurrection of Jesus Christ, will never accept or understand the higher and deeper levels of apologetics. They are as clueless as the elementary math student in a trigonometry class.